INKSTER, Mich. — It was just a routine birthday for Jeralean Talley on Friday — a visit to the doctor in the morning, birthday cake in the afternoon for the Michigan resident. Except that Talley, who turned 115 on Friday, is believed to be the oldest person in the United States and the second-oldest in the world, according to Gerontology Research Group, which validates ages of the world's longest-living people. 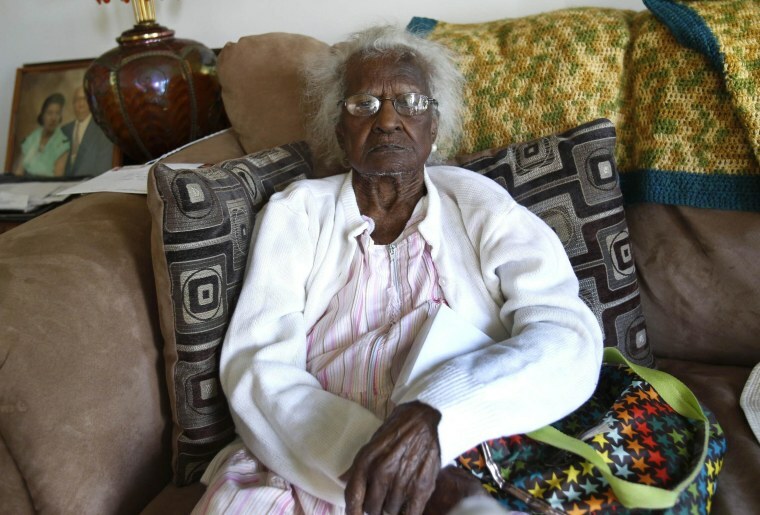 Talley, who lives in this Detroit suburb, credits her faith for her longevity. "It's the Lord. Everything is in his hands," she said in an interview at the one-story brick home she shares with her daughter Thelma Holloway, 76. "I feel fine," Talley said. Talley is not impressed by the attention from the public and news media she gets on her birthday. "I'm sick of it," Talley said. Talley was born in Georgia on May 23, 1899, one of 12 children. She moved with her husband, Alfred Talley, to Michigan in 1935 for his job at a Ford plant. He died in 1988. "Treat your neighbor as you want to be treated," she said. "I don't tell no lies on you and you don't tell no lies on me."